Hath you seen the Jane Austen-y goodness that is Indie Jane? For heaven’s sake, get thee hence. If you dream of Regency dresses and men in (ahem) breeches, there’s no better go to site on the web. They’re having a mad giveaway that includes a Kindle Fire and 20 Janeaholic novels. But even if you miss the giveaway, you ought to check the site out. All the good Janeites do so. I am hosting Jeff Tsuruoka (@jtsuruoka on Twitter) again for Lillie McFerrin’s Five Sentence Fiction. This week’s theme is Pirates. There’s still time if you’d like to join in! Arrr! We left the town in flames but the captain died of his wounds less than half an hour after we put out from the burning harbor. Shrike, an savage old hand with one eye and six teeth who drooled when he spoke, and his cadre of backers confronted me in the dim corridor outside the captain’s quarters to challenge my ascension to the captaincy. 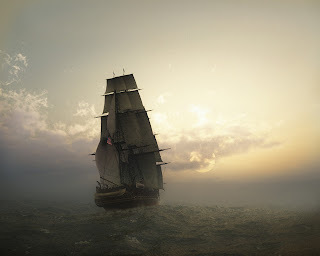 My first order as captain of the Pogue Mahone was to have Shrike’s most ardent backers throw his corpse and then themselves overboard. Sharks need to eat, same as us. I have not reviewed many ebooks on my blog, but made an exception in this case as I’d been intrigued by the sample chapter and wanted to read the rest. When A.G.R. 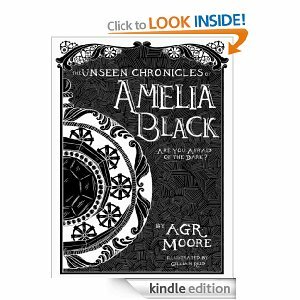 Moore (@agrmoore on Twitter) approached me, I agreed to review his book, The Unseen Chronicles of Amelia Black. 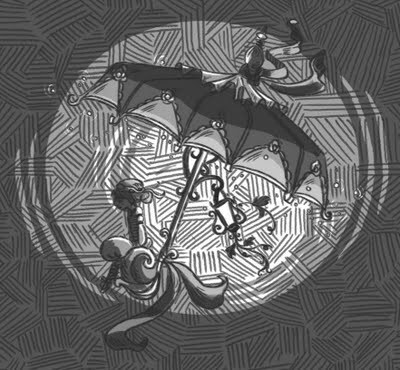 The book is a little fantasy and a little steampunk: there are wizards and robots and monsters and a haunted forest. And an airship, naturally. The illustrations were done by Gillian Reid and, honestly, were some of the best I’ve seen. It was a perfect marriage of picture and text. Her interpretations really brought the story to life. I enjoyed Amelia as a heroine, as she’s exactly the type of plucky little girl I would follow into an adventure like this. There is a great exploration of the shades of grey within us all – not all of the good guys are good and even the bad guys are not as they seem. Amelia has powers that she struggles to control, on her quest to find her parents. The narrative suffered from a slightly disjointed feeling. The action would occasionally leave Amelia for awhile and focus on the other characters, but none of them had the draw for me that she did. It was a quick read and pleasurable. Some truly not-so-nice things happen to the characters along the way, a few nightmarish moments, so be prepared. This book would be too intense for young children, but might be just right for tweens and, of course, adults who enjoy Young Adult literature. I recommend this book for lovers of Tim Burton, Neil Gaiman’s Coraline, and dark fantasy. It’s a very affordable buy on Amazon and totally worth it – support indie authors! I had originally planned “A Room of My Own” as a limited run feature to showcase the writing spaces of a handful of writers I knew. This feature has been so popular, I have decided to extend into writers with whom I am less familiar. This week, I am showcasing Eva Rieder, (@evariederauthor on Twitter). According to Eva’s blog, this feature inspired Eva to clean her own creative space! So read it, to reward her for her trouble. Q) Please describe your space, describing any features that make it extra special to you. A) My space is a comfy corner in my office/guest room, and I painted it a light blue color several years ago to make the setting more tranquil. When the window is open the desk is lit just right, and I can enjoy a breeze while I immerse myself in writing. This desk is actually a table that I randomly saw at a side-of-the-road giveaway the week I moved in to my house (no kidding), so I snatched it up and made it my desk. It could definitely use some drawers, but I have a bookcase to the side and drawers in my printer table, so I’ve made do. I kept meaning to buy a bulletin board, but instead I just started irresponsibly pinning everything to the wall in the corner: pictures of my sister and niece, quotes and writing rules, and those delightful little postcards by Anne Taintor. The bookcase to the left is what I call my Writing Bookcase—as opposed to the other cases in the house filled with all sorts of books I have and haven’t yet read, mostly fiction—and it is filled with writing guides, reference books, and various office supplies. Q) What is your favorite/most inspiring object in this room? A) There are actually three things in this room that inspire me. One is the illustration above the desk of a princess walking across a tightrope over a spider web, followed (led? chased?) by a cricket and a spider playing their instruments. It is by Arthur Rackham and you can see it here. My mother gave it to me when I was seven or eight, and it’s lived directly above my desk as fantasy inspiration ever since. (I always thought I was the princess when I was young!) The second thing is the word list by the window—I’ve been adding to it since the age of fourteen, a collection of words that I thought sounded pretty or that I just enjoyed saying because they rolled pleasantly off the tongue. Finally, there is a note on the board from my best friend of 19 years that she wrote in ’06, a response to an earlier version of my current WIP. She slipped it into the manuscript and I found it later, a note of encouragement and cheering that somehow only best friends can manage to pull off in a way that truly warms your heart. Q) What rituals do you go through when you want to write in this space? 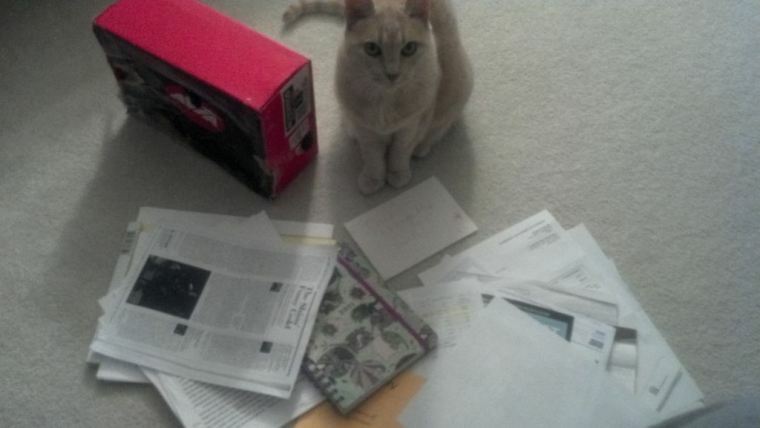 A) My ritual is pretty simple, actually: grab coffee/tea, kick cat out of chair, open file on computer. I’m such a planner in my non-writing life that I try to fly more spontaneously when I write. Or, when I need to have a strategy, I sort it out the night before as I prepare for bed. A) First, yes, that is a Vampire Diaries calendar from 2011. My mother gave it to me as a Christmas gift because the show is a family obsession, and though I still haven’t read the books, I think the series is quite clever. We call each other each week to debrief! As for the calendar being outdated…vampires are immortal, remember? Who cares what year it’s from? Second, there is a rainbow-painted bobble-head dog on my desk that I can’t seem to move away to save my life. My niece painted it when she was about to turn three, and whenever she comes to visit, she’s ecstatic that I still have it on my desk (she is now almost five). I tell her it’s because she did such a good job painting it that it makes me happy when I write. Though it originally just sat there, now it’s actually grown to serve that very purpose—I smile every time I look at it. Little ones can be so darn clever! Thanks to Eva for sharing her Room with us. Want to share your Room? Email me at annabbps AT gmail.com with a photo and answer the above questions.